Woohoo! This week marks the 6th Anniversary of Loving on Me. It’s been a sweet and often chaotic journey that has given me more joy and fulfillment than I ever could have imagined. The funny thing is, had I realized it would be so hard to build a movement based on self-love I’m not sure I would have ever taken the first step. When I started Loving on Me I was in a really dark place. If you’ve read my first book, you know that I had experienced a major life interrupted moment. Suffering from panic attacks, exhaustion, and utter confusion about what to do next – God gave me Loving on Me. At first it was a safe space to share an intensely personal season of understanding and accepting my self-worth. My hope was that in being open about my journey it would encourage others to embark upon their own. What I didn’t realize was that my story would resonate with so many others because, well, it was their story too. Women around the world were struggling with self-love, worth, and learning to lead in every aspect of their lives. In a short period of time what was my private pain became a public rallying cry, to get in the driver’s seat of our lives and stay there, to value ourselves beyond what we do, and to create the lives we most want to live. A movement was born, and it’s been growing ever since. I’ve learned so much from the people who have joined me on my grand adventure. Loving ourselves is no easy thing. Life is constantly giving us reasons to see ourselves as less than and unworthy. Every season has its own struggles, causing us to wonder if we’re really enough. I’m chuckling because as I write this blog I’m also having a hot flash. Menopause has given me a whole new set of challenges, and let me tell you – this getting older business ain’t for sissies. Even still, life is sweet. I’m determined to age gratefully, holding fast to what I’ve learned along this self-love journey. Learning to love ourselves is an exploration to be enjoyed, not a goal to be achieved. There is no end to this self-love journey. Every season offers a deeper understanding of who we are, and our unique value to the world. As more is revealed, more love and acceptance are required. I’ve learned to settle in and enjoy the ride. We deserve our own love and respect. Easy to say, hard to do. Our inner critic works over time to ensure we don’t miss any of our flaws and failures. But I have learned to crush my critic by being my champion. Learning to speak kindly to me has had a profound impact on my life. Even when we can’t change the circumstances we still have a choice. When life feels out of control we can quickly spiral into worry. We feel powerless, as if life is happening to us, instead of truly living. But the truth is we always have a choice – how we will respond. Whatever circumstances we find ourselves in, our response is always our own, and it can make a world of difference in our perspective, happiness, and outlook for the future. Self-care is not a luxury. It’s a necessity. I used to think of self-care as a day off, or a trip to the spa. However, in learning to love me I’ve discovered that self-care (an activity that we do deliberately to take care of our physical, emotional or spiritual well-being) is a necessary part of my everyday. See what we love, we treasure. It’s special so we give it extra attention and care. Ladies – we deserve that same treatment. Here’s a few tips on how you can practice #365SelfCare. The key is to stop looking for everything to fall into place before we take action. Life does not require us to have it all figured out up front. Our courageous efforts are rewarded with greater confidence, insight, and progress. Loving you unlocks grace – for yourselves and others. When you understand and accept who you are you experience unconditional self-worth. When you rock it, you celebrate. When you jack stuff up, you still love you. The bonus is because you’ve stopped beating yourself up when things aren’t perfect, you more easily extend that same grace to others. I can’t tell you how freeing it is to see people as people – amazing, fallible beings who most of the time are trying to do their best, even when they fall short. Grace is a powerful act of love. Join us on social. Every day on Instagram, Facebook, and Twitter we’re sharing positive messages to affirm your worth, and challenge you to aspire higher. Read my book. 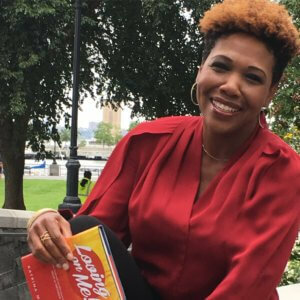 Loving on Me shares my journey to unconditional self-worth, as well as the stories of some of the women I met through the blog. It’s a great way to get some practical advice on how to get out of your own way, and go get your more. Sign up for our FREE course. If you’re struggle is balance, then this is a great tool for you. Find out how to go from searching for work/life balance to creating the life you most want to live. These are just a few of the tools and resources we offer. More courses and resources are coming soon. This Loving on Me movement is here to stay! Join us on the journey and become an empowered women empower others. I can’t wait to pour into you. PS – Fill out the form below to receive our monthly newsletter. You’ll be the first to know about our free courses, upcoming seminars, and greater ways to connect with like-minded women.